Curry, varuval, poriyal or palya with okra- are different versions of the same recipe which involves roasting the vegetable. I prefer a non stick kadai for low fat cooking. Cooking with okra needs constant monitoring. I prefer using fresh okra rather than the frozen alternatives. Here's my recipe. Wash okra using a colander. Drain off water completely and keep it aside. The vegetable should be moist while using. Not wet. Chop the okra discarding both ends. Don't worry about the slimy sticky stuff. 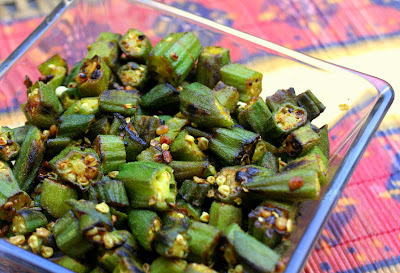 Use only okra that cuts easlily / smoothly - avoid over grown ones - which is called muthhal. Heat oil in a heavy bottomed wide non stick kadai. Add mustard seeds. When it pops, add the vegetable and give a brisk stir. Leave the vegetables in medium to low heat and stir very occasionally. Constant stirring will make the vegetable soggy. After about 15 minutes add the salt, turmeric, red chilli powder and asafoetida. Give a quick stir and allow it to roast in medium heat for a minimum 10 to 15 minutes. Stir every 5 minutes. Avoid frequent stirring. By now the vegetable should have cooked well. If the okra looks like as shown in the above picture, it is time to turn off the heat. Enjoy the roasted okra. Vendakkai varuval ready. thanks. enakku pudichha kai idhu. All time favorite veggie. Thanks for sharing this simple yet yummy dish. This one is my favorite. Goes well with sambaar rice.